What It’s About: While “folly” seems like too broad a category to confine to one page, this particular disambiguation refers to the architectural term, for a decorative building that either has no purpose, or advertises a purpose it does not actually fulfill (ie. a building that looks like a house, but is not habitable). Such structures came into fashion in the 16th and 17th century, when owners of wealthy estates, jealous of neighbors who had ruins on their property, would construct fake ruins. The term “folly” was coined for these, but was soon applied to any building that did not serve its apparent purpose. Strangest Fact: In 1881, developer James Lafferty built Lucy the Elephant, a six-story animal-shaped building in Margate, NJ, just south of Atlantic City. While at different times it functioned as a hotel, restaurant, office, cottage and tavern, it was intended as a tourist attraction and remains so to this day. Visitors enter through a spiral staircase in her left rear leg, there’s a large hall inside the body of the beast, and another stairway leads to the howdah on her back, for views of the ocean, the Atlantic City skyline, and most importantly to Lafferty, real estate he himself was offering for sale. Lafferty built two more elephant buildings in the 1880s, neither of which survived the century. The more impressive of the two was a 7-story hotel in Coney Island with a cigar store in one of its 60-foot-around legs that burned down in 1896. The other (of indeterminate size) was built in Cape May, NJ but was torn down within 15 years. Lucy was nearly demolished in 1969, but a campaign to save the elephant raised money to move the structure 100 yards further away from the shoreline and refurbish the interior. The elephant was soon after named a National Historic Landmark. She was unscathed by Hurricane Sandy. Controversy: There's a bit of discussion of whether some famous landmarks are technically follies (the Taj Majal: no; the Eiffel Tower: depends on what you mean by ‘folly’; Las Vegas’ more fanciful hotels: almost certainly) Which leads us to the main controversy: what exactly is a folly, and does this article correctly express that? Several Wikipedians think not, typified by user Tarquin, who says “I'd rather we had an article on architectural follies than this bizarre sanctimonious article,“ but makes no suggestions for improvement. Thing We Were Happiest To Learn: A century before the Vegas strip began recreating world landmarks, Budapest’s Vajdahunyad Castle combined several of Hungary’s most iconic buildings into one amalgamation. Originally built out of wood and cardboard as a temporary structure for the country’s 1000-year anniversary, the castle proved so popular it was rebuilt as a permanent structure. It now houses Europe’s largest agricultural museum, plus a statue of one of Hungarian history’s biggest names—Anonymous. This particular Anonymous was the author of Gesta Hungarorum (Deeds of the Hungarians), a chronicle of early Hungarian history written around A.D. 1200. Also noteworthy: Ireland is home to many follies built during the Potato Famine by the otherwise unemployed. The site says that, “the society of the day held that reward without labour was misguided,” meaning that the English government didn’t want to save someone from starving to death unless he worked for it. But hiring the destitute on useful construction projects would put existing builders out of work. So the solution, only slightly less elegant than Jonathan Swift’s, was to pay people to construct useless projects, including roads in the middle of nowhere, or a pier in an inland bog. 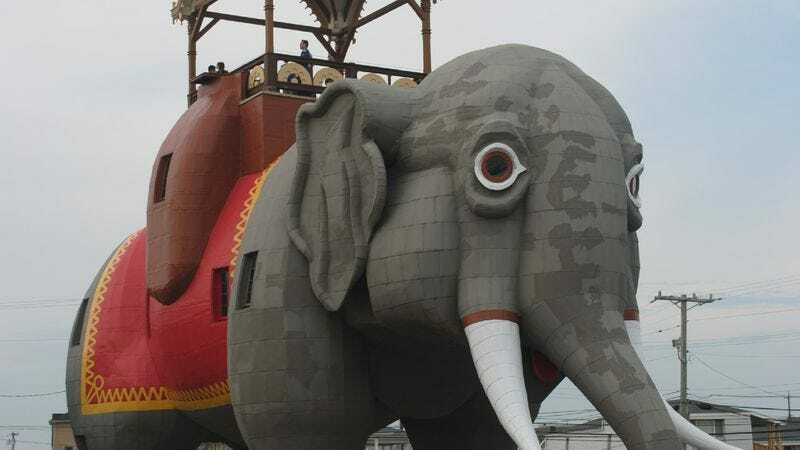 Best link to elsewhere on Wikipedia: The page for Lucy the elephant leads to Charles Ribart, who, more than a century before Lucy's construction, planned a three-story elephant-shaped building in Paris, with a drainage system in the trunk. The French government rejected his design, and instead used the space to build the Arc de Triomphe.